In this experiment extraction of amylase from wheat seeds and the effect of amylase on the breakdown of the starch is observed. The effect of temperature is also observed on the activity of the enzyme. Slightly grown wheat seeds, starch solution, I2-KI solution, watch glasses, mortar. Germinate about 30 grams of wheat until their roots are 0.5 cm long. With a little sand grind the seeds in a mortar. Add 10 ml of distilled water, and ground up substance properly. Allow the mixture to stand for two hours and then filter. The filtrate is a crude extract of enzyme. 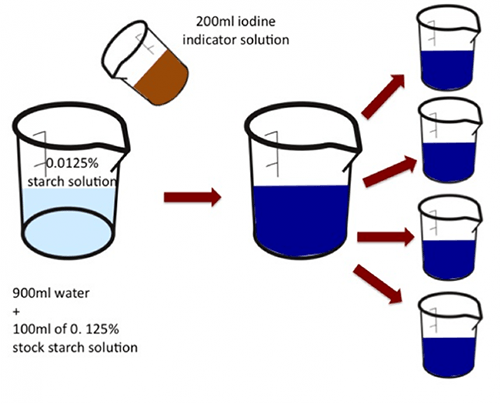 Prepare Iodine-potassium iodide reagent by dissolving 15 gm of Kl and 3 gm of I2 in 100 ml of water and diluting to 1 liter. Place some watch glasses in a row on white paper. With the help of a medicine dropper, pipette out 5 drops of the starch solution on each watch glass. Add to it 5 drops of enzyme extract and mix them thoroughly. To each watch glass add a drop of Iodine-potassium iodide solution. The color of the solution will turn blue (The specific color of the starch). Note the time when color will disappear due to the conversion of the starch into glucose because of the action of “Amylase”. Take 5 ml of enzyme extract in another test tube and boil it. Add 5 ml of starch solution to it and mix thoroughly. Jest the presence of starch with Iodine-potassium iodide solution. The color of the solution will not turn blue. Pour it in watch glasses and note if any change in color is there. 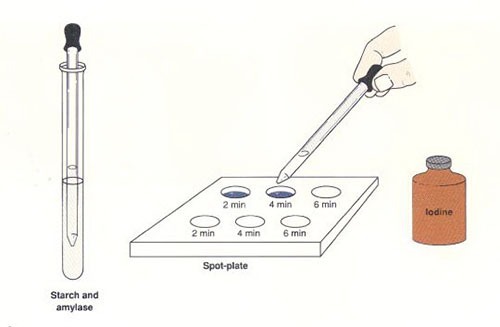 Use separate pipettes to draw starch solution and the extract from different sources. If the successive tests show the end point, consider the first of these as end point.